The proliferation of cloud storage providers has led to many of us storing our documents using a variety of different providers: Google Docs (s goog), Zoho, Dropbox, SugarSync, Pogoplug. Box.net, etc. That makes managing those documents tricky. Moving documents between services isn’t easy, and having to log into several places just to look for one document is inefficient. 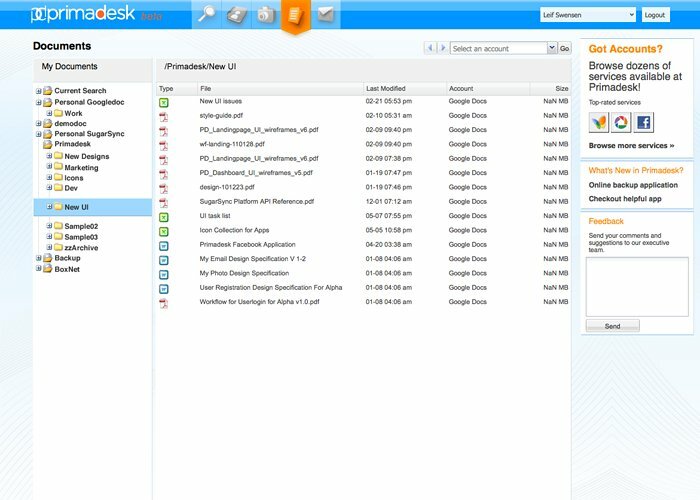 Primadesk is a web app that wants to be a kind of desktop file manager for the cloud. By integrating with a variety of cloud storage providers, it allows users to access and manage all of their documents through a single interface. Simply being able to view all of your documents in one place is handy, but the company has now added some new features for the app, such as comprehensive document search capabilities and the ability to copy documents between services using drag-and-drop, that make it much more useful. When you click on a document to open it, Primadesk actually opens a new browser tab, automatically signs in to the appropriate service, and then takes you to the document. While it’s not quite as seamless or as fast as using, say, Finder on OSX (s aapl) or Explorer on Windows (s msft), it does provide a simple and convenient way to search for, and take action on, content that’s stored across many different cloud services. And unlike Joukuu or Gladinet, which are Windows apps that provide similar “cloud file manager” functionality, Primadesk is web-based, and so works cross-platform and on mobile devices. As well as document management, Primadesk can back up documents using Amazon’s S3 cloud storage (s amzn), manage photos stored on Picasa, Flickr (s yhoo), Facebook and other services, and can also offer a unified inbox that can monitor emails from several different accounts. Primadesk is currently in beta and is free. After launch, the product will likely move to a freemium model, possibly charging for the backup features. The company also plans to make money by charging OEM license fees for the use of its technology. Not sure how this is different / better to SMEStorage, which has been around a while and which I use already. It lets me open documents from a zillion clouds in it’s web file manager into either Google Docs or Zoho office. I can also read documents from an Cloud in Google Viewer and edit pictures with Picnik. Our goal is to help users search, manage and backup all their content spread all over the internet. No it is not your old age :). Your concern is very real and we are working on changing the site to give more information about us and about the pre-cautions we take. We have a good security background (we built the world famous personal firewall ZoneAlarm earlier in our lives) but we do agree we need to do a better job communicating with the customers.